Posted in: 1 Pageant Pages, 2 Shout-out-Looks. 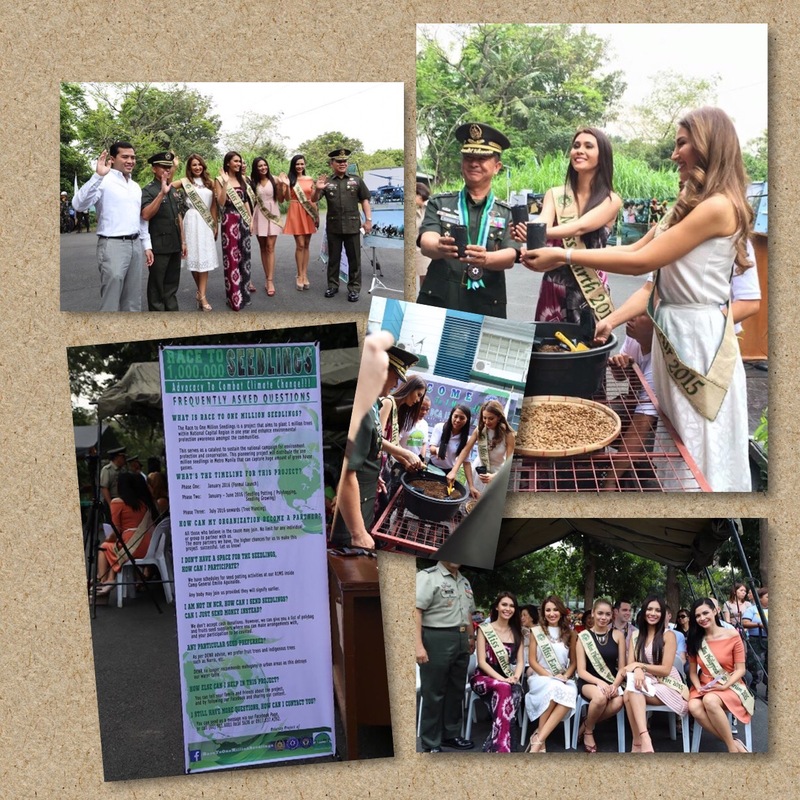 Tagged: AFP, Angelia Ong, Carla Valderrama, Dayanna Grageda, Jona Sweett, Miss Earth 2015, Race to 1 Million Seedlings. 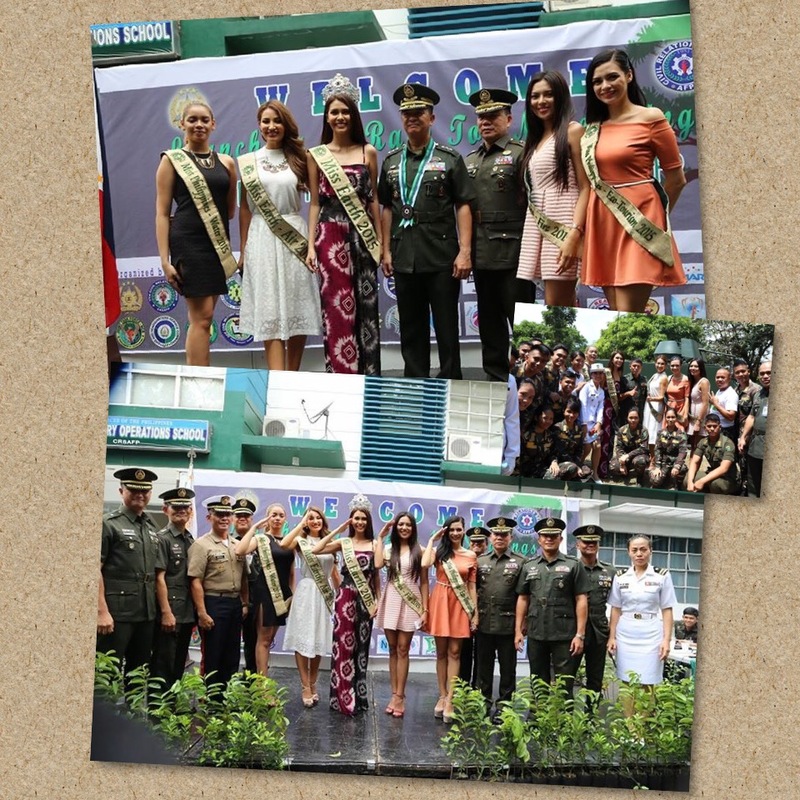 Just recently, Miss Earth Foundation partnered with the Civil Relations Group of the Armed Forces of the Philippines (AFP) for the opening of the Race to 1 Million Seedlings Nursery which will serve as its nurturing place till the start of the actual planting season for the same. The Race to 1 Million Seedlings is a project that aims to plant 1 Million Trees within the National Capital Region (NCR) in one year and enhance the environmental protection awareness among different communities. Don’t worry if you don’t have the area to plant the seedlings. You can always coordinate with R1MS inside Camp General Emilio Aguinaldo to participate in the seed-potting activities thay will be regularly held during the projected period of completion within the year. 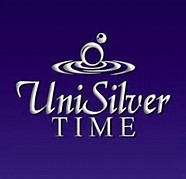 This is open to individuals or groups who are willing to be part of the important endeavor. Note: Cash donations not accepted. Instead, you will be given a list of polybag and fruit seedling suppliers with whom you can make arrangements with. Fruit trees and indigenous trees (like Narra) are recommended. DENR has now discouraged the planting of Mahogany Trees in urban areas since they have been found to destroy the water table. Posted in: 1 Pageant Pages, 2 Shout-out-Looks. 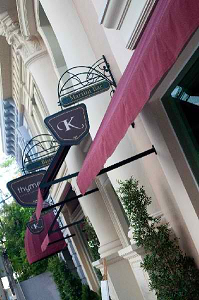 Tagged: Bing Cristobal, Carla Valderrama, Runway Party. 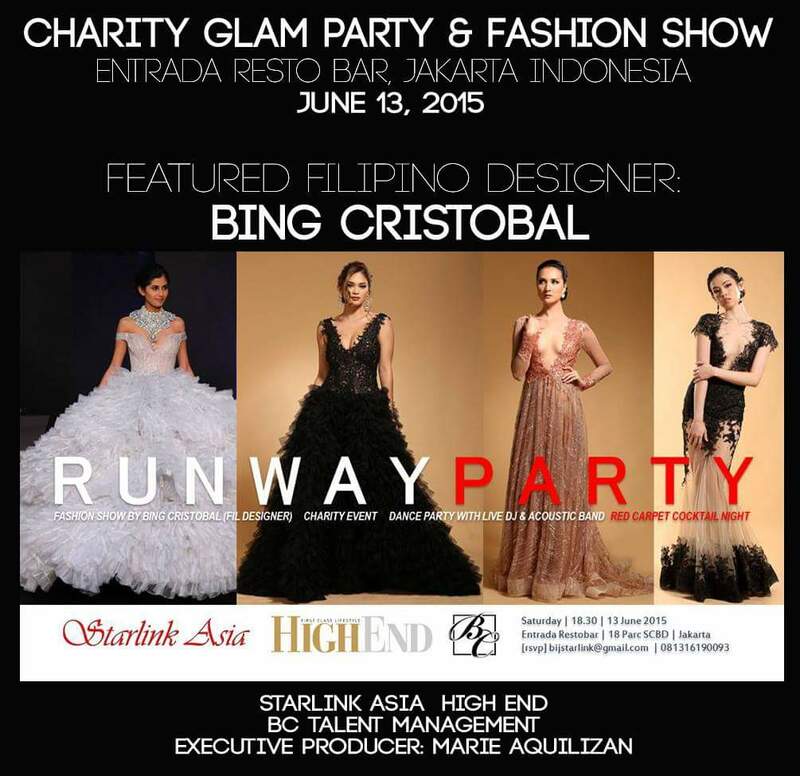 Well-loved Designer Bing Cristobal – who is a favorite among beauty queens and pageant contestants – continues with his gradual conquest of the regional market with a fashion show titled ‘Runway Party’ that has been scheduled for June 13 at Djakarta’s Entrada Resto-Bar. Several of his models, including a number of Bb. Pilipinas winners – will fly in to the Indonesian capital to walk the ramp in the Charity Glam Party that will showcase his latest collection. Posted in: 1 Pageant Pages, 2 Shout-out-Looks. 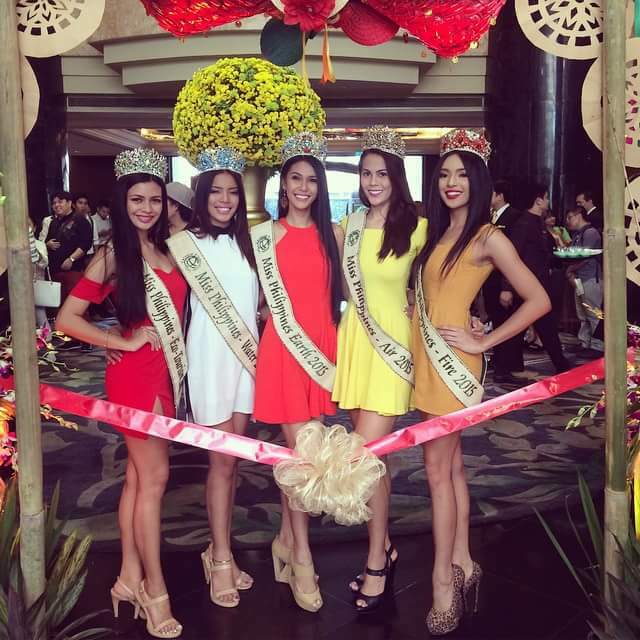 Tagged: Angelia Ong, Carla Valderrama, Catherine Joy Marin, Chanel Olive Thomas, Diana Mackey, Jamie Herrell, Jona Sweett, Miss Earth 2015, Miss Philippines Earth 2015, SM MOA Arena. 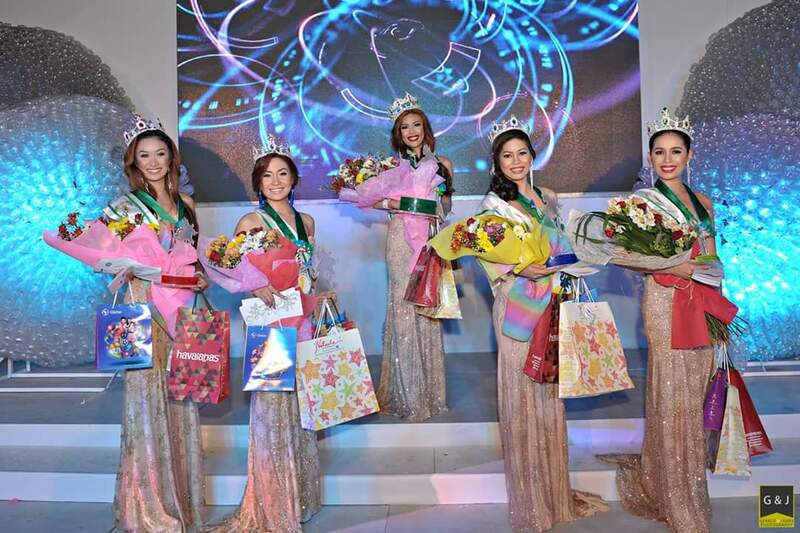 A new Earth Warrior and the country’s representative to Miss Earth 2015 has been crowned. And she is none other than Angelia Gabrena Ong from the City of Manila. 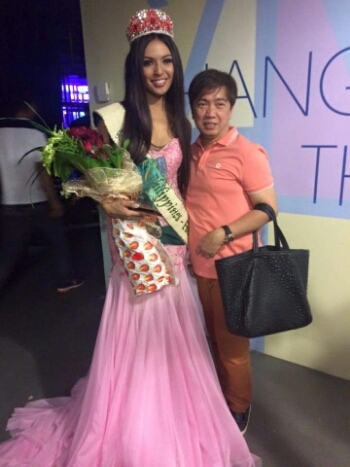 She will now be known as Miss Philippines Earth 2015. 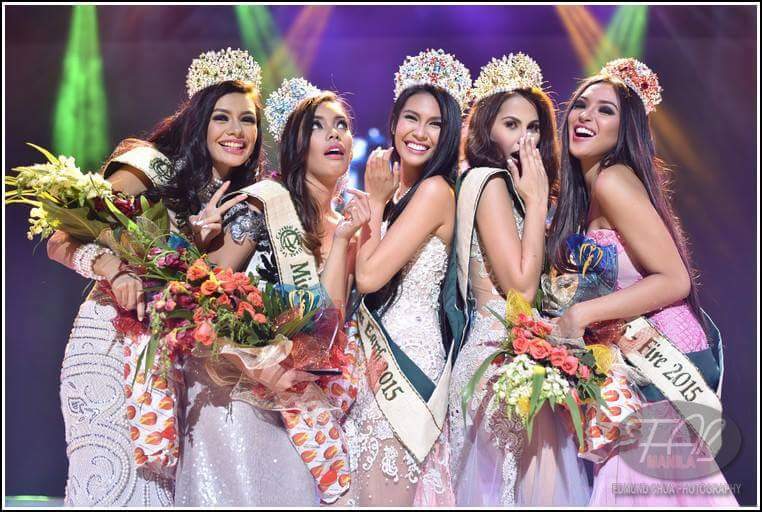 In a grand finals event that extended to just a little over three hours inside the SM MOA Arena (and happily finished just a little after 10pm), the elemental beauties of 2015 were given their respective titles, including one for Eco-Tourism. 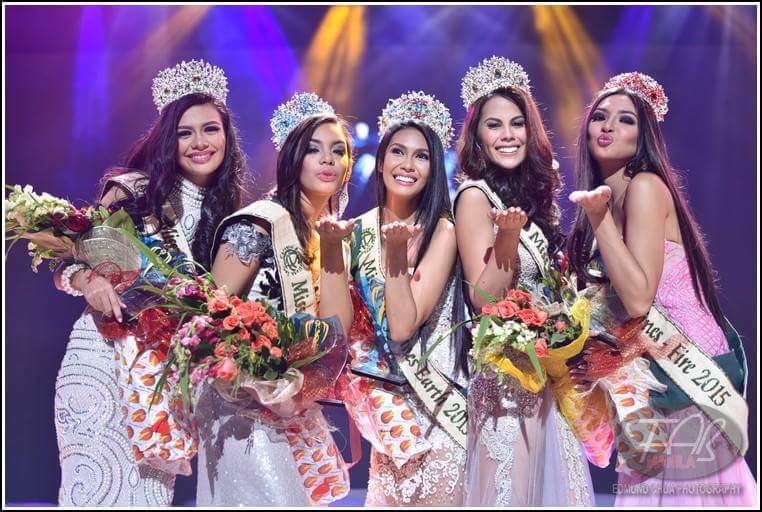 Long installed as one of the top favorites for the win, Angelia has her toughest opponent Chanel Olive Thomas of San Antonio, Nueva Ecija settling with the Miss Philippines Air title. 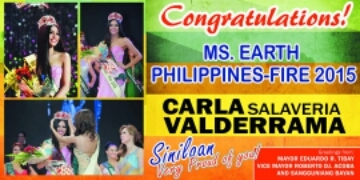 Catherine Joy Marin of Bago City took Miss Philippines Water, with Carla Valderrama of Siniloan, Laguna clinching Miss Philippines Fire. 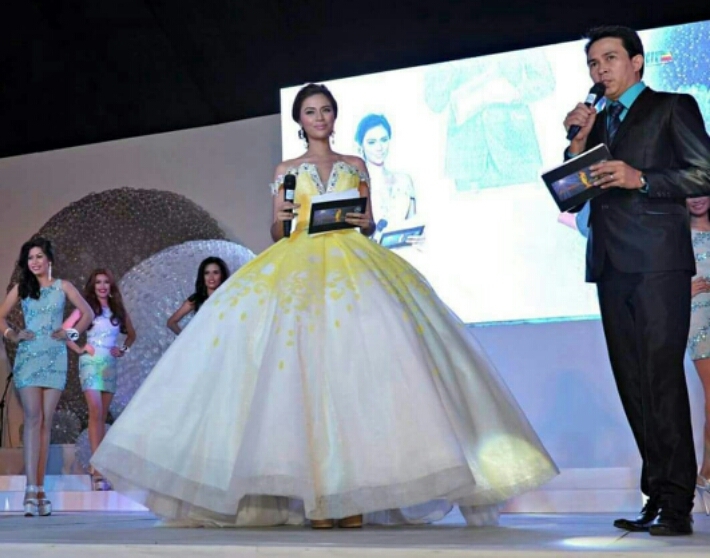 Rounding up the Top 5 is Jona Sweett of Iloilo City who was named Miss Philippines Eco-Tourism. 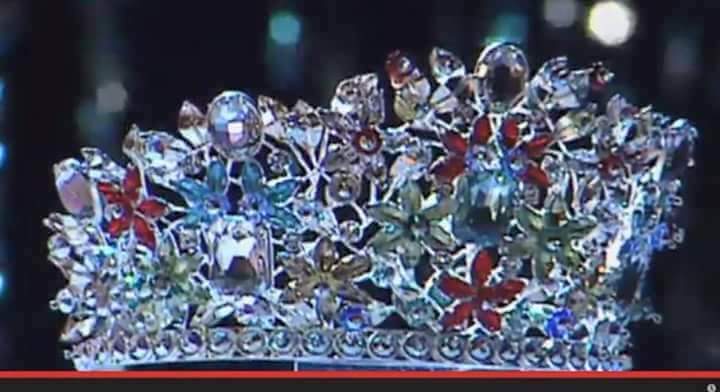 As expected, Angelia and Chanel were neck-to-neck for the new MPE2015 crown. The breaks went the former’s way, though. It’s unfortunate that Diana Mackey of Cabanatuan City (who was stunningly resplendent tonight) failed to crack the Top 5 after she delivered a less than satisfactory turn during the Q&A. All in all, this year’s edition has really been predictable for the Top 2 placements – Angelia and Chanel. Catherine from Bago City was a truly pleasant surprise, while Carla and Jona in the winning circle are just fine. Posted in: 1 Pageant Pages, 2 Shout-out-Looks. Tagged: Aiko Rachelle Caraan, Alyanna Cagandahan, Alyssa Ashley Calimlim, Angelia Ong, Carla Valderrama, Chanel Olive Thomas, Chezka Carandang, Darlene Hipolito, Darlene Pepito, Diana Mackey, Jian Cayla Salazar, Jocehl Cristoria, Jona Sweett, Miss Philippines Earth 2015, Sofia Loren Deliu. Now that we’re down to thirty-eight (38) Official Candidates for Miss Philippines Earth 2015, did it make my life easier for the usual pageant predictions I share a few days or less before finals night? Not at all. At least not with the ones I am seeing as the likeliest to spoil the very-top-of-the-heap finishers this coming Sunday, May 31. You see, I have comfortably zeroed in on the possible successor of Miss Philippines Earth 2014 Jamie Herrell (who will move on to her duties as Miss Earth 2014 afterwards). Like it or not, this year is going to be a tight-as-a-tick battle between Chanel Olive Thomas (of San Antonio, Nueva Ecija) and Angelia Ong (of the City of Manila) for #1. Between the two, one is definitely getting Earth and the other will have to settle with Air. And frustrating as it may sound, the thirty-six other ladies will have to be contented grabbing the remaining elemental (plus Eco-Tourism) spots in the Top 5. Whoever among them is found most deserving will join Chanel and Angelia in the winning circle. It’s that blunt (read: predictable) of a scenario. For now, let me formally present to you the sixteen (16) Earth Warriors in my first cut, which is honestly not a big lot to holler about. 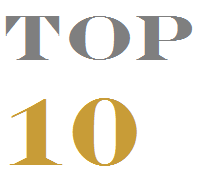 Because in the next trimming, there will be only ten (10) left, and half of this number, or the lower five of the Top 10, are already considered runners-up for 2015 despite equally going through the motions of Q&A and Evening Gowns. 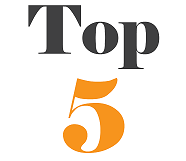 The minute another half is called to make the top quintet, the winners will have already been announced, save the rankings. The first eight (8) of my Top 16 arranged according to regions, with NCR coming in first. Three (3) from NCR, Four (4) from Northern Luzon, Four (4) from Southern Luzon, Four (4) from the Visayas and a single qualifier from Mindanao – that is how I classify the composition of my Top 16. 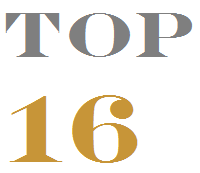 As expected, the 15th and 16th placers on my list are the hardest to fill, but the easiest to replace if need be. But I won’t give you the full satisfaction of knowing those semifinal cellar dwellers anymore. Let’s just say that I can easily give those rankings to the ones graded as #17 or #18. It’s the Top 10 that I found tricky. I found myself vacillating back and forth among three (3) girls who should make the cut, where only only one of them can move on. The first nine (9) places are already filled up courtesy of Chanel Olive Thomas, Angelia Ong, Diana Mackey (of Cabanatuan City), Alyssa Ashley Calimlim (of Villasis, Pangasinan), Sofia Loren Deliu (of Baguio City), Alyanna Cagandahan (of Santa Cruz , Laguna), Chezka Carandang (of Quezon City), Carla Valderrama (of Siniloan, Laguna) and Mhon Theress Menaling (of Mandaue City). 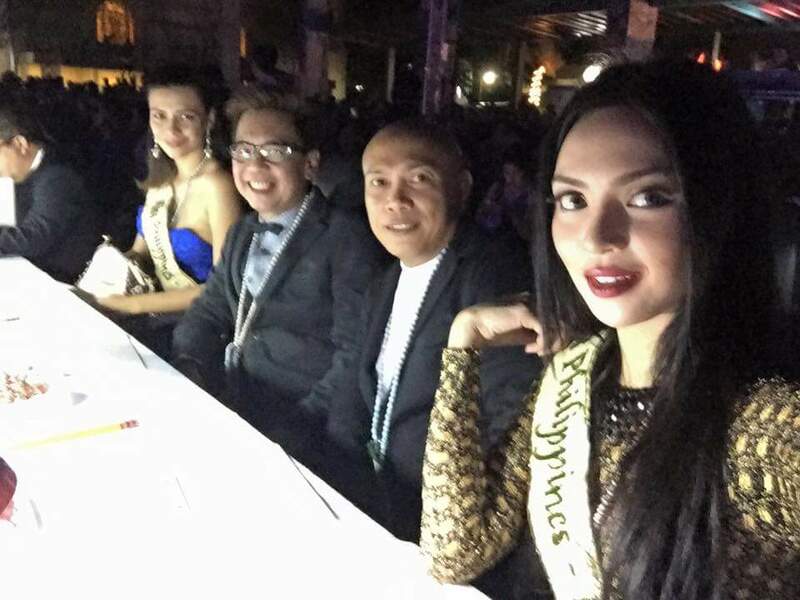 I had a hard time choosing from among Darlene Pepito (of Ormoc City), Jian Cayla Salazar (of Guinobatan, Albay) and Jona Sweett (of Iloilo City). I did not resort to blind-folded dipping of my hand inside a bag containing their names, though. I made things painless and went for the Best in Long Gown Gold Medalist. How sweet it is then for Jona Sweett as my 10th. Now in this segment, I decided to be anti-climactic. No use lingering on the suspense anymore. I already made the choice of Chanel Olive Thomas and Angelia Ong as my personal predictions for Miss Philippines Earth 2015 and Miss Philippines Air 2015, respectively. In addition, I strongly feel that Sofia Loren Deliu would make a wonderful Miss Philippines Eco-Tourism 2015 given her profession and strong advocacies that would serve the environment well. That leaves us with Water and Fire, or the elements that actually rank 3rd and 4th. Diana Mackey is a relatively easy choice for Water. She has been running 3rd mostly in my scoresheet, and I really wouldn’t mind seeing two ladies from the Province of Nueva Ecija in the Top 5. It’s my choice of Alyssa Ashley Calimlim for Fire that made me slightly squirm in my seat. I was tossing between her and Chekza Carandang or Alyanna Cagandahan to get in. 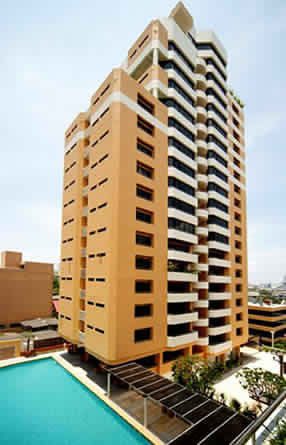 This is where I just made the one hard decision to give up on the ladies from Quezon City and Santa Cruz, Laguna. There are inner workings that I cannot fully expound on anymore. Unless someone privately eggs me to do so. Angelia VS Chanel all the way! I stated earlier that the fight between Chanel and Angelia for the crown is going to be tough as nails. Any one of the two making it would make the organizers very happy. They are both sweet, charming, committed and down-to-earth (no pun intended). So it will really boil down to that one final question that will be answered in the penultimate portion of the pageant proceedings. One wrong reply (or choice of words/statements) and it could be game over. But hey, Miss Philippines Air ain’t bad a reward for all the hardwork all throughout. 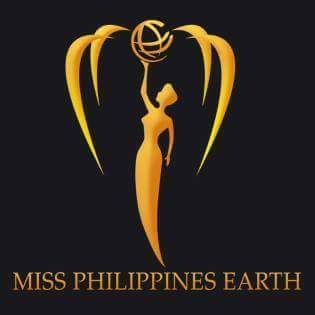 It’s just that Miss Philippines Earth will compete in Miss Earth 2015, aside from being long remembered by the faithful fans and followers. Posted in: 1 Pageant Pages, 2 Shout-out-Looks. Tagged: Alyanna Cagandahan, Alyssa Ashley Calimlim, Angelia Ong, Carla Valderrama, Chanel Olive Thomas, Darlene Pepito, Diana Mackey, Jian Cayla Salazar, Jocehl Cristoria, Mhon Theress Menaling, Miss Hana 2015, Miss Philippines Earth 2015. 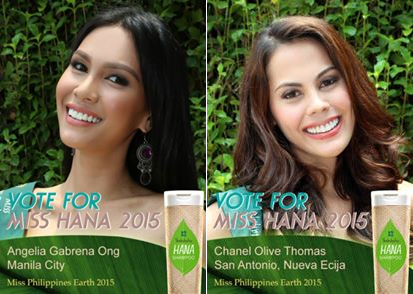 Hana Shampoo is the Official Presenter of Miss Philippines Earth 2015. And as such, a Miss Hana 2015 will be announced on finals night come May 31 from among the ten (10) Hana Beauties of Nature pre-selected during the Press Presentation. This is where your support for your favorite candidate will come in. 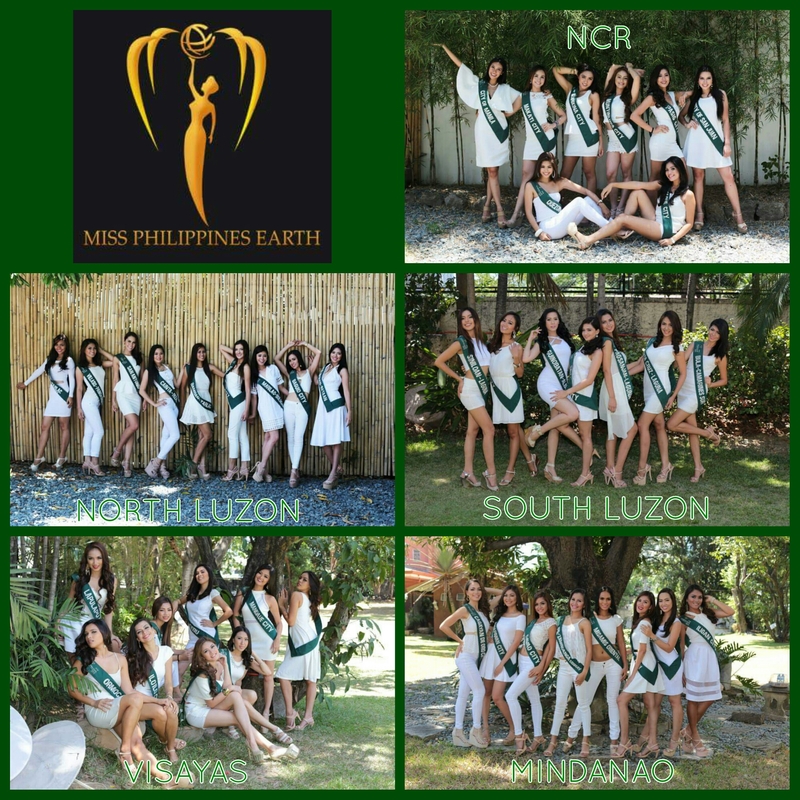 Just visit the Facebook page of Miss Philippines Earth (Official) where you can see the individual photos (gathered in the grid above) of the ten qualified ladies. Vote, or like the image if you will. 60% of the decision will come from the FB likes, while 40% will be earmarked for Hana Team Decision (based on looks and personality). You have up to May 29 to do so. The ten (10) Hana Beauties of Nature are: Alyanna Cagandahan, Alyssa Ashley Calimlim, Angelia Ong, Carla Valderrama, Chanel Olive Thomas, Darlene Pepito, Diana Mackey, Jian Cayla Salazar, Jocehl Cristoria and Mhon Theress Menaling.